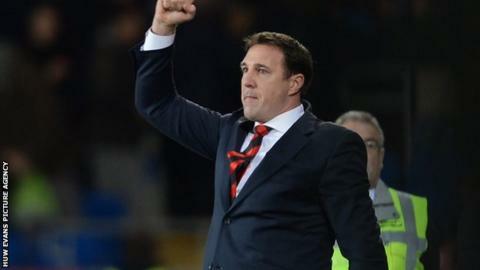 Manager Malky Mackay says his Cardiff City side were worth their draw with Manchester United. The Bluebirds came from behind to record a 2-2 draw in injury time with the Premier League champions. Kim Bo-Kyung came off the bench to score a stoppage-time equaliser for the home side at Cardiff City Stadium. "I thought we deserved at least a point, it was very brave the way we played and created chances against the champions," said Mackay. Cardiff came from behind twice to prevent United from moving into the Premier League's top four. Striker Fraizer Campbell levelled the scores after Wayne Rooney had opened the scoring for the visitors. United captain Patrice Evra then put United back into the lead with his header just before the break. "To a man there was real belief in the way we played and the chances we created," said Mackay. "We got into nice positions, were calm and worked it well up the pitch. "The first goal showed real belief in the way we play, I know we can do that. Fraizer's chip [which hit the cross bar] would have been sublime. "Overall, we were certainly worth a point against the team we were playing today. "We conceded cheap goals, for Manchester United they scored good goals. "For the first, we gave the ball away 25 or30 yards from our box and with Manchester United they show what they can do with that. "For the second, it was one man not tracking his runner - there was one man on Evra and he didn't do his job. "To concede a minute before half-time was a blow, I thought we were worthy of going in at half-time at 1-1." But Mackay saw his Cardiff side produced a stunning comeback in the dying moments against United, even if most at the game felt striker Rooney was lucky to be on the field. Mackay, though, had no arguments with Rooney only being shown a yellow card or the performance of referee Neil Swarbrick. "Overall, I thought the referee called it right," said Mackay. "I've seen Rooney's [yellow card] and certain referees might have sent him off for that. "Overall, Neil Swarbrick did well and I thought he called the big decisions well today."